Recap of November 2017: Nifty fell by 1.05% during the month; Nifty 500 grew by 0.01%while Nifty Mid Cap and Nifty small cap gained 1.62% and 1.90% respectively. In terms of sector, Consumer Discretionary, Consumer Staples, Information Technology and Industrials rose by 3.33%, 1.36%, 3.29% and 2.09% respectively while Energy, Materials, Health Care, Financials, Telecom and Utilities fell by 3.67%, 2.05%, 1.44%, 0.39%, 3.54% and 1.12% respectively. 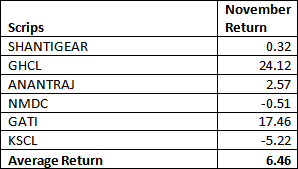 The month of November was a classic case of Mean Reversion i.e stocks which were gaining in last few months performed poorly while stocks which were losing during last few months performed well during the month. Stocks with Earning Score (ES) above 70 (at the end of October) rose by a median of 0.80% whereas stocks with Earning Score (ES) below 30 (at the end of October) grew by a median of 2.55%. Stocks with Price Score (PS) above 70 (at the end of October) rose by a median of 0.33% whereas stocks with Price Score (PS) below 30 (at the end of October) grew by median a of 2.64%. And these are the stocks that gave an average return of 6.46% in November. Atul works with an Advanced Market Research Group at Narnolia Research. His forte is quantitative research on Indian equities. He is a computer science graduate with Masters in Finance from Faculty of Management Studies, Banaras Hindu University.Atul works with an Advanced Market Research Group at Narnolia Research. His forte is quantitative research on Indian equities. He is a computer science graduate with Masters in Finance from Faculty of Management Studies, Banaras Hindu University.